The strengths of these films are not so much laughs as sincerity and heart. 211 min. Touchstone Pictures. Director: Charles Shyer. Cast: Steve Martin, Diane Keaton, Martin Short, Kimberly Williams-Paisley, Kieran Culkin, Eugene Levy. The family comedies Father of the Bride and Father of the Bride, Part II are perhaps best distinguished as weepies for dads (especially dads with daughters). Know thyself: if you're a softie at heart, these two remakes will undoubtedly work on you, the sentiment being much more prominent than humor. If you're looking for the "wild and crazy guy" version of Steve Martin, you've come to the wrong place: while that guy shows up in a few scenes, he's been appropriated (if not castrated) by Disney. These are the contempo, California-casual versions of 1950's Father of the Bride and 1951's Father's Little Dividend that one should expect from the then-married couple Charles Shyer (director, producer, co-writer) and Nancy Meyers (producer, co-writer): sunny, sweet, and safe. Father of the Bride finds Martin taking the Spencer Tracy role of a father beleaguered by the tasks of hosting his daughter's wedding and attempting to keep the affair within reasonable bounds. A sneaker manufacturer by day, George Banks finds the stress of the wedding overshadowed only by his emotional difficulty accepting that his daughter Annie (Kimberly Williams) is no longer his little girl, but a woman ready to embark upon her own life of career and family, with fiancé Bryan MacKenzie (George Newbern). George's wife Nina (Diane Keaton) shows she's considerably more level-headed (certainly in her "emotional intelligence"), though her own excitement about a wedding means George can expect vetos rather than sympathy when it comes to his naturally stingy approach. Without even having to fight, George wins one battle when the Banks house becomes the reception site, but he's bound to lose the war when near-incomprehensible foreign wedding planner Franck (Martin Short in fine fettle) prices the event at $250 a head, pushes for elaborate redecorations, and orders up three swans. Much, of course, will go wrong, and yet the big day will somehow be perfect for the two people who really matter: the happy couple. But first, George must suffer the tortures of the paternally damned. Keaton is wasting her time here, and only one scene has the wit to be worthy of Martin: a very funny meltdown in the grocery aisle, when George decides he will no longer play sucker to the conspiracy between hot-dog manufacturers and hot-dog-bun manufacturers. But the rest is certainly watchable in that milequetoast, bourgeois pocket cozily inhabited by '90s Hollywood family comedies. Helping the movie along are effective supporting performances from Keiran Culkin as the youngest Banks, BD Wong as Franck's assistant Howard Weinstein, and Peter Michael Goetz and Kate McGregor-Stewart as the in-laws (Eugene Levy also puts in a brief cameo as a wedding singer). Four years later, Father of the Bride, Part II pulled off the rare trick of being a sequel remake, one that arguably improves on its immediate predecessor. Shyer, Meyers, and pretty much the entire cast are back, including Eugene Levy in the new and larger role of Middle Eastern house-flipper Mr. Habib. This time, Annie has a baby on the way, which makes George and Nina grandparents to be. The news ups the ante on George's midlife crisis, prompting some amusingly pathetic anti-aging tactics (this plot thread effectively sequelizes the first film's scene of George squeezing into an old tux while singing "What's New, Pussycat?"). Drama over whether or not to sell the Banks homestead as part of George and Nina's "second act" of American life gets brushed aside with a big surprise: Nina, too, is pregnant, prompting a whole new round of self-searching for everyone and, thankfully, opportunities for Keaton to develop her character and even be a little funny. The Banks enlist Franck first for Annie's baby shower, and then to supervise the creation of a nursery for George and Nina's new child, but he gets more than he bargained for when he's swept up in the dash to the hospital. While expanding Short's role sounds, on paper, like an ill-advised choice, it works. Though never explicitly identified as such, Franck is obviously gay, and yet Short perfectly calibrates his funny mannerisms to stop short of stereotype: his feyness and his gentleness are as certain and yet unplaceable as his Central European accent. More importantly, Short and the filmmakers take care this time to make us believe in Franck as a real person and, as it turns out, to make us care about him. In a straight-woman role, Jane Adams pulls off a similar trick, along with Short proving all over again that the strengths of these films are not so much laughs as sincerity and heart. 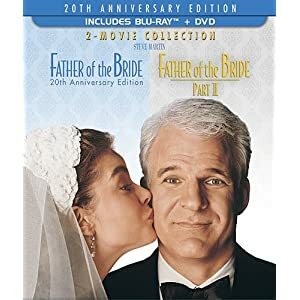 Disney's Father of the Bride 20th Anniversary Edition/Father of the Bride, Part II 2-Movie Collection Blu-ray + DVD combo pack (say that five times fast, will ya?) improves upon DVD, and with budget pricing, the efficient combo pack of both films should appeal to fans. Still, the A/V quality could have been better. It's apparent that the transfers derive from old hi-def masters struck at the times of the original DVD releases; as such, they suffer from inconsistent color and ruddy skin tones, as well as weak black level and shadow detail, with problems compounded on the second film in the areas of edge enhancement and excessive grain. On the bright side, the first film shows noticeable improvements in detail and texture, which—oddly enough—are not so creditable for the sequel. The two lossless DTS-HD Master Audio 5.1 surround mixes seem to make the very most of their source material; the comedies make limited aural demands, but clarity and effects are strong, the music is pleasant, and rear channels do contribute some ambience. The set also includes some worthwhile bonus features, starting with a 2005 audio commentary by director Charles Shyer, which finds the filmmaker chattily recalling and explaining the film, from his take on the original film, his concept for his remake, and a variety of production anecdotes. Also on the Blu-ray disc are the EPK featurette "An Invitation to Father of the Bride" (10:36, SD), with B-roll footage and comments from Shyer, co-writer Nancy Meyers, Steve Martin, Martin Short, Kimberly Williams, and George Newbern (no Diane Keaton, sorry). "Martin & Short Interview Each Other" (5:14, SD) offers more from their on-set EPK interview: specifically, the best of their riffing and ribbing of each other. 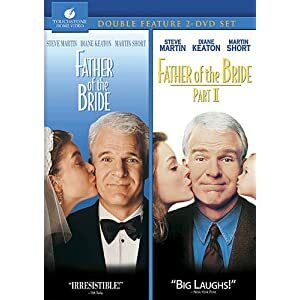 That's it for the Blu-ray, but the DVDs include the same Father of the Bride extras and a few more extras on the Part II DVD (but NOT—buyer beware—the "audio commentary by Steve Martin and Martin Short" promised on the Blu-ray keepcase). The Part II DVD includes the "Original Theatrical Trailer" (2:35, SD) and the EPK featurettes "Production Story" (4:20, SD) and "Just Between Friends" (3:53, SD). All site content © 2000-2019 Peter Canavese. Page generated at 04/20/2019 09:31:53AM.